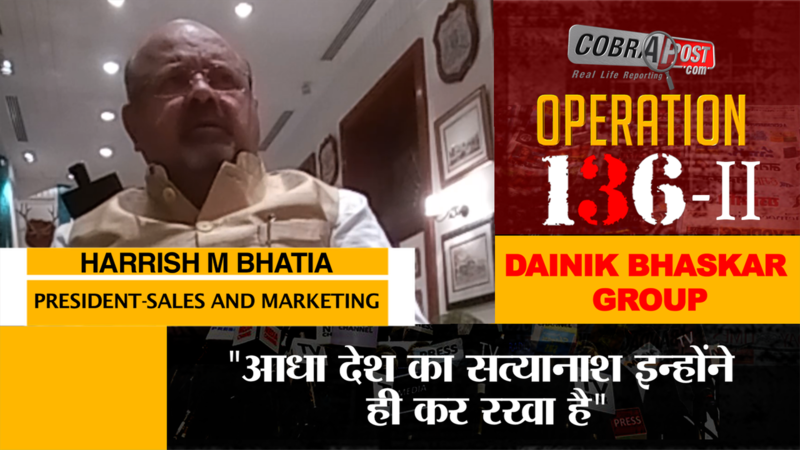 New Delhi: In the second part of Operation 136, Cobrapost exposed owners and high-ranking personnel of more than two dozen media houses, both mainstream and regional, the biggest ones and the smaller ones, the oldest ones and the newer ones. The media houses agreeing to run the paid media campaign included Times of India, India Today, Hindustan Times, Zee News, Network 18, Paytm, Bharat Samachar, Suvarna, Star India, ABP News, Dainik Jagaran, Radio One, Red FM, Lokmat, ABN Andhra Jyothy, TV5, Dinamalar, Big FM, K News, India Voice, The New Indian Express, MVTV and Open magazine..‘Operation 136: Part II,’ in fact, showed Indian media’s underbelly in its most visceral form. A day before the second part of Cobrapost expose of Indian media houses Operation 136 was scheduled for release at the Press Club of India, New Delhi, on May 26, the Dainik Bhaskar Group got an ex parte injunction from the Delhi High Court forbidding us from releasing the story. Honouring the court order, we decided to cancel the scheduled press conference and released the story on our web site sans our expose on Dainik Bhaskar. However, the court has on September 28, 2018 vacated the injunction and we are at liberty to release the story. In its 60-year-long journey that began in 1958, Dainik Bhaskar has grown from strength to strength. With its presence in 14 states, publishing 63 separate editions simultaneously in Hindi, English, Marathi and Gujarati, the daily has emerged as the second largest newspaper in the country. According to the Indian Readership Survey 2017, the daily is India’s fourth newspaper in terms of readership. To check if the group is willing to undertake his openly communal and defamatory agenda, Pushp Sharma met the following officials of the Dainik Bhaskar Group: Ajay Pratap Singh Tomar, Assistant Manager (Ad Sales), Indore; Abhishek Purohit, Sales Manager, Noida; Abhishek Dubey, Sales Department, Noida; Rahul J. Namjoshi, Business Head; Harish M. Bhatia, President (Sales and Marketing); Amit Sabharwal, Unit Head (Ad Sales), Chandigarh; Pawan Agarwal, Deputy MD, Noida; and Vijay Garg, CFO, Noida. Then, the campaign will be geared up to mobilize the electorate on communal lines by promoting speeches of Hindutva hardliners, the likes of Vinay Katiyar, Uma Bharti and Mohan Bhagwat, among others. They will have to run this campaign on all platforms – print, electronic, radio or digital including, e-news portals, web sites and social media such as Facebook and Twitter. So, when the journalist met Dainik Bhaskar Group President (Sales and Marketing) Harish M. Bhatia, also present there was Namjoshi. The journalist once again spins the same tale about the Hindutva agenda and campaign against political rivals of the party in power. As part of this campaign, the journalist adds, you will have to digitally promote the visits and speeches of Mohan Bhagwat. Bhatia agrees to work on the agenda: “Haan ho jayega (Yes it will be taken care of).” With this commitment, an understanding between the parties is established. As the negotiations move on, the journalist tells them that their organization is trying to build a base in Andhra Pradesh. You know what that Nizam and those people think. That needs to be cleaned out. At this point, the discussion gets overtly communal as Bhatia agrees: “Haan, haan inko toh saaf karna zaroori hai … matlab ye jab tak saaf nahi honge desh ka uddhar bhi jabhi hoga … addha desh ka satyanash inhone hi kar rakkha hain (Yes, yes, it is necessary to cleanse them … I mean until these people are cleansed, the country cannot be salvaged … they have ruined half the nation).” Namjoshi also chips in to suggest: “Kaaf der baat ho rahi thi Bengal mein karna hi padega kuchh jo Gujarat mein kiya thha 2001 mein (I have been hearing this talk that it has to be repeated in Bengal as well what was done in Gujarat in 2001).” When the organization is reeking with such communal virus, can a communal agenda be denied to be run by its high officials? Giving them a circuitous explanation why it is necessary to pay them as much in cash as possible, the client the journalist asks them to accept 70 per cent payment in cash, although he would prefer to pay 100 percent in cash. While the journalist is discussing the issue, Bhatia chips with a “Humm,” “Haan” or “Accha (Got it)”. Interestingly, Bhatia has joined the Bhaskar Group only recently. You see, the journalist now tells him, we want to reach out to the youth of Punjab so that we can inject Hindutva in their impressionable minds through the preaching of Shrimad Bhagwad Gita. How can you help us? The journalist next met Dainik Bhaskar Group’s Deputy Managing Director Pawan Agarwal and Namjoshi. Later on, the group’s Chief Financial Officer Vijay Garg also joined this meeting. There is a content person present in the meeting to take specific instructions with regard to the campaign. In the conversation, Namjoshi directs the Dainik Bhaskar staff to make 30–40 creatives, telling him that the content should be pro-Hindutva and pro-BJP and political rivals such as Rahul Gandhi, Mamata Bannerjee and Mayawati should be lampooned using satire. It is Namjoshi who introduces their client the journalist to his boss Pawan Agarwal, who is promptly briefed by the journalist on his agenda, to see if it elicits any ethical response from the Deputy MD, but to no avail. The journalist tells Agarwal that he has already met Atri and has discussed everything threadbare. He had advised me to bring it to your knowledge as well. “Haan wo toh unke paas hee hai approval ke liye matlab wo sab ek hee jagah se aapko kar denge execution sab neeche ground pe karenge (Yes, he has the authority for approval, I mean, he will approve all things and will get the execution done on the ground level),” informs Agarwal. To discuss the cash delivery Namjoshi calls Chief Financial Officer (CFO) Vijay Garg on phone to join the meeting. Assuming that the client would deliver the cash the same evening, Namjoshi even suggests that they will ask all the staff members to leave the office premises before 8 o’clock that evening. Sometime later Chief Financial Officer Garg joins the meeting. When the journalist asks the CFO what time would suit them to receive the delivery of cash, he is told that all staff will leave the office by 7 in the evening. They spend an enormous amount of time discussing the difficulty counting the cash in machines and the danger it poses in case there are people who notice this large volume of cash lying around the office. Garg advises the client to divide the bulk of cash into parts to make it easier for them. To count the currency bills, Garg has planned to bring in counting machines as he says: “Toh main office mein rahoonga toh wo contact karke kyonki vo maine abhi do counting machine mangai hain (I will stay in the office, they can contact me … I am about to have two counting machines brought in).” He also asks the client if he can ask his cash delivery team to fetch in counting machines in case his men fail to do so. After discussing with them how the cash will be delivered to them, the journalist tells them that the cash has to be fetched from Jangpura, a locality in Delhi, and he would have to leave so that he could write instructions to his point man on a slip to do the needful that evening. We would like to make it clear that Operation 136 should in no way be taken as an effort to undermine Indian media or question its sanctity as an institution. Our investigation does not intend to cast any aspersions or pass judgment, either, on the journalists who are working in these media platforms. They have done good journalism in the past and will do so in future. However, if the management indulges in paid news, in all its gray shades, it creates a very difficult atmosphere for the journalist to ply their trade. This story aims to underline our earnestness to address the malaise that has been dogging Indian media for the past three decades or so and look within to make course correction, so that the faith of India’s citizenry in this vibrant pillar of democracy is not dented.